It's a fact of life that legacy industries are often killed off by newer industries spawned by new inventions, so the generally worsening situation of the newspaper industry should come as no surprise as more news moves online. What does surprise me is that some in the industry seemed determined to speed up the process and hasten the deaths of their companies. I've just read that the National Newspapers of Ireland has adopted a new licensing scheme where they expect websites to pay to link to one of their members. The Newspaper Industry (all these newspapers) had its agent write out demanding money. They wrote to Women’s Aid, (amongst others) who became our clients when they received letters, emails and phone calls asserting that they needed to buy a licence because they had linked to articles in newspapers carrying positive stories about their fundraising efforts. Note that this is not paying for an excerpt, which is not that unreasonable, or some punitive measure for the copying of an entire article. No, the NNI wants to charge for links like this, this, or this. For those 3 links, I now have to pay the NNI 300 euros. Seriously. Apparently this group of 15 newspapers is under the impression that merely mentioning an article on one of websites is not legal; they think it is copyright infringement. Don't hurt yourself trying to understand their reasoning; it's utter nonsense. First and foremost, let's consider the business aspect. There's the fact that naming a work's title does not and cannot be copyright infringement - not under US law (I'm not familiar with Irish copyright law). A link (or the URL inside it) is little more than a name, so arguably the same rule would apply. And even if it is more than a name, the URL can be regarded as a factual statement (you can find the content here) and facts arguably cannot be copyrighted in the US (some courts disagree). Unfortunately this is not the first time this insanity has appeared, though none have gone quite so nuts as the NNI. There's an ongoing push in Germany to pass a law which would force Google to pay publishers for using the tiny snippets in Google's search results, and Belgian newspapers recently settled a similar dispute with Google. France is also considering a similar law. What's even better is that the Belgian settlement came after Google lost the court case, and complied with the judge's order to delist the newspapers from the search engine. That of course cost the Belgian newspapers a lot of traffic and reducing their revenue. And that, my dears, is the true crazyness about demanding payments for links and snippets. A link from one website to another is free advertising. It's a source of page views which the recipient didn't have to pay for. By that same rational….. Do the newspapers intend to pay for each link to an advertisers site that they host? Possibly ending up paying more for the traffic they drive to advertisers sites than they receive for hosting links in the first place? Surely they’re killing their own revenue model. What we're really talking about here is that these Irish newspapers want everyone else to pay for the privilege of giving the NNI member websites more traffic. That alone is enough to show what a nutty idea this is. 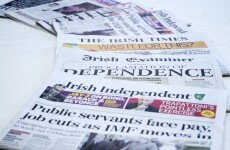 Why should Irish newspapers give a rat’s rear end about US law? They shouldn’t, but I’m not familiar with Irish law so i qualified my statement. Of all the various complaints made about online publishing and digital rights, I think that the news industry’s are the most legitimate, but this is not the way to solve their problems. The simple fact is, without a paying public, our best news sources will go out of business within the next ten years. If you want ‘real’ news, you need to have real reporters in the field, and that means travel expenses, printing costs, organizational costs, salaries, and much more. Getting the news online is great, but if everyone just expects their news to magically appear for free in the results of a Google search then no one will want to start a paper, hire a foreign affairs correspondent, or dedicate their lives to reporting the news. There will be no money to support it. Unfortunately, it seems that some publications are reacting in all the wrong ways with pay walls, annoying ads, and endless emails harassing you about renewing your subscription. Paying for a link or for a few lines of quoted text will seem offensive to most people, so they will end up turning to the blogosphere (which, when it comes to political news at least, is an incredibly unreliable source) or just watch TV. The news media is an important institution that needs to adapt to the changing times. The news industry needs to find a way to salvage the physical paper, but they need to do so without appearing like the bad guy in this whole situation. More digital subscriptions and online perks (like access to a periodical’s complete archives) should be offered, but overall, they really need to remind people why it is important to pay for a honest, informative, and reliable news source. Utter nonsense, (at least in the US) from sucking on cafr (go look it up) funds, to government funds, to advertisements (pharma/SSRI’s , GMO, Monsanto, GE) what you call the “best news sources” are mere propaganda with a few facts mixed in to keep everyone confused. They get their authority from the FCC who has long since had their original mission statement go AWOL. The POTUS chooses the FCC control. The only REAL NEWS is coming from public access tv on the broadcast spectrum now. The only REAL NEWS on the web is coming out from bloggers, whistleblowers who can mange to publish with getting themselves killed, and new journalism v2.0 from the logic and integrity of the Tim’s and Luke’s (wearechage) of the world. The problem is that the fascist corporate news get’s the press passes and the bloggers and public access types get denied access, no interviews, police harassment, and on and on. It’s exactly opposite. This is truly the most asinine policy I’ve heard of in a long while. First of all, this has nothing to do with using text from a news site. We are talking about a link and nothing but a link. I operate a busy site. The last thing I want to do is send traffic from my site to a competing site. These newspaper sites now expect me to pay them hundreds of dollars to send them my website’s traffic? There is no other way to look at this. It’s absolute stupidity. Google is a business that makes money by posting links to these businesses. Perhaps Google should just remove all links. Bloggers should remove all links. Every site or blog that attracts traffic should refuse to send any traffic to these news sites. Let them bask in obscurity and irrelevance. By the way, as a competing website, I appreciate every single link that sends traffic my way. More traffic means more ad impressions. More ad impressions mean more income. So please, by all means, post all the links you want. If your site gets lots of traffic by posting links to my site, that’s GREAT! It means your website can send more and more traffic my way. Stupid, idiotic newspapers. They will never understand how the Internet works. Alrighty… so, to avoid accidentally linking to sites like that, time to null route some hosts and ip addresses. Just saying. Is it just me, or does no one see the difference between a private citizen linking to or referencing a published article and an aggregation service such as Google doing it on an industrial scale and making money from it? Agreed, it is madness to chase org’s for referencing (a la Women’s Aid) but, when services such as Google, Yahoo et al turn it into a business, then the originators of the content deserve a share. Except that you’re ignoring the relationship here. Google is offering free advertising for the website owners. They found a way to make money off of ads rather than billing the website owners directly. Why would you expect Google to pay for the free advertising they are giving to the website owners? It doesn’t make sense. A fair point, but Google is generating an audience for its own advertising based on aggregated content that it did not produce. Therefore, Google is using the attraction of content that cost it nothing, to generate income. That hardly seems fair. Were Google to do nothing but feature a headline and link fair enough, but it rarely does, it often provides snippets or more which can mean that the reader stops at the Google page and goes no further, effectively cutting the original source out of the traffic path. Except Google isn’t putting their ads next to the content. They’re putting ads next to links, and getting those links did cost Google money. They run the servers which went and found the links, rated them, and served them up to users. And again, the advertiser usually pays the advertisee. In this case the advertiser is the website, and the advertisee is Google. It is completely backwards to argue Google should pay for the privilege. Sorry mate but that’s a moot point. Look at the detail, what you are effectively doing is cutting off your site from webcrawler access, making in unsearchable by any means. To stop Google you end up stopping just about anyone finding your site without typing in the URL—it is a blunderbuss solution to a sniper problem and a cynic like me might see that as deliberate. And as regards Google not putting the ads next to the aggregated content? Come off it, who are you kidding? If they are on the page, what matter where they appear? I am all for a free web, in so far as it is possible, but I also subscribe to Dr Johnson’s truism on writing for money. So if someone else is making money from what I have written without my consent or sharing the profit, then I’ll fight for it to be stopped. Google makes money from its audience looking at ads that Google sells. Google generates much of that audience by aggregating content from sources it does not pay for. The cold hard reality is that much of that audience, despite your protestations, does not go to the content originators’ site. The originator of the content, who has expended resources generating it, does not benefit. If professional journalism is to survive, something must be done about this or we will degenerate into a world without professionals in this area. I for one would lament that state of affairs. As a realist, I can see that the only options are to let Google have the links for free or to take the content away (and forgo the traffic). But no one is going to do that because (as you have agreed) we all benefit from the free advertising. So instead some groups are looking to force Google to pay. They want to have their cake and eat it too, and that is the unreasonable position. And Google is pretty much it for the search engine market, so focusing on them alone is not unreasonable. Although there are ways to block just Google. When it comes down to it, any attempt to force Google to pay will result in Google delisting the websites in question. They’re not gonna pay, for pete’s sake, so instead they will take the reasonable step of not showing the content they won’t pay for. That strikes me as a cure which is worse than the disease. It seems to me they should just make it a subscription website, so those who pay can view the paper. It must be a publicity stunt. Its insanity, if this was the law then the internet would grind to a halt. I can see it now, everyone starts charging for links, only to find out that no one goes to there site anymore because there are no links to the site anywhere. “a href ” and making sure you closed your brackets, the link was correct, etc. You in essence are working as a slave, and on top of it they want to now charge. That’s like saying, You should interview bands and post articles on Your own dime, and if that isn’t enough, then they demand pay for the privilege of linking to the official band’s website. Or to somewhere to buy swag. What a joke. 3. Stand ground, Sue back, force them to show their (non existent) contract with you, and the hypocrisy of their broken logic. LOL, this page returns a 404. I remember when I began publishing Think Magazine in Singapore, the Straits Times sent me some of these collection letters for linking to their website in a directory of Singapore English language media. They had been quite aggressive and successful in their controlled economy for a long time, until the Singapore Supreme Court invalidated the law that allowed it.